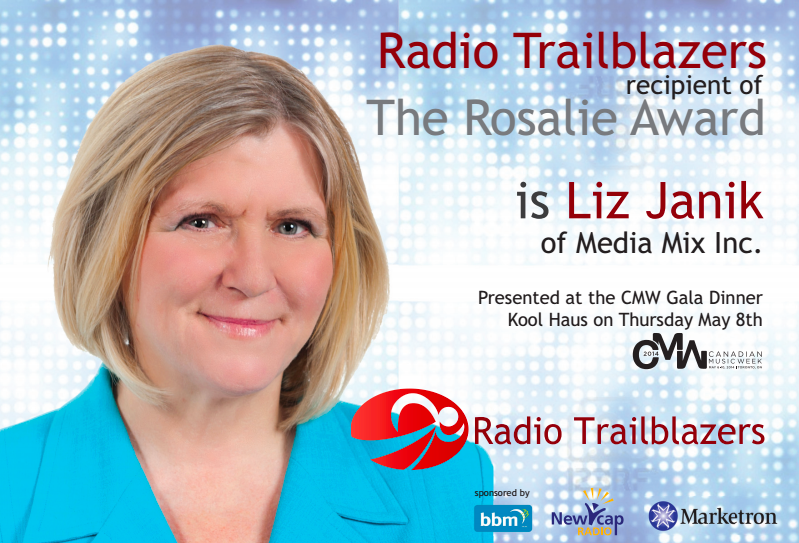 Radio Trailblazers is pleased to award the 2014 Rosalie Award to Liz Janik, President, Janik Media (a division of Media Mix Inc). Liz began her radio career in the studios of the venerable CFNY FM in Brampton, Ontario, then known as “The Spirit of Radio”, where she was a prominent on-air host and Director of Canadian Music Development. When Liz moved into research and consulting for radio stations, she was at the forefront of inventing new and successful formats. As Sean Ross wrote in Billboard about Janik, “As part of the team that launched WKQX (Q101) Chicago in the early ’90s, she was effectively one of the founders of what coalesced over the next five years as the “modern AC” format. At KKDM Des Moines, Iowa, she oversaw a station on the cusp of alternative and pop that bewildered label reps, sometimes with songs that were played nowhere else, but which can now be identified as a forerunner to today’s “whatever adult women like” version of Adult Top 40.” Liz was also responsible for developing a new format at Hot 97 in New York, which would turn out to be the world’s first hip hop radio station. Liz says she has a talent for “looking at the numbers and hearing a format”. Liz is also Chair of Humber College’s Radio Advisory Committee.